Out of 7 books published by Ihar Babkou three won particular attention of the reading public from Belarus and from beyond. His first book of poetry “Solus Rex” received Hliniany Viales (a Belarusian Literary Award set by the Society of Free Literature Men ) back in 1994. His novel “Adam Klakotski and his Shadows” (2002) has been translated into Polish and was short-listed for Angelus Literary Award in 2009. In 2012 Ihar received Zalaty Apostraf Award (set by literary journal “Dzejaslou”) for the best prose publication over 2011. 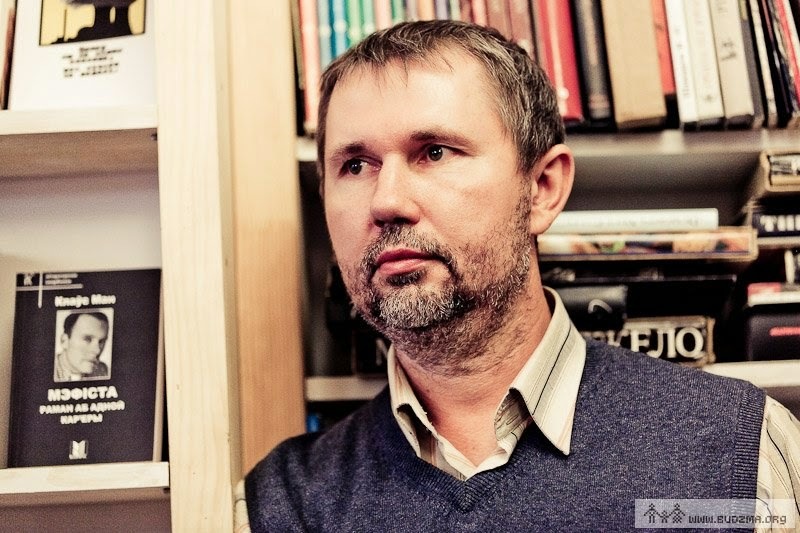 His second novel “Kvilinka” became the laureate of Gedroyc Literary Award this year. The site of the Award offers a review of the book as well abstracts from it, together with the recent information on the author. Another relevant review of the novel “Khvilinka” (compared with Шклатара, 2013, a novel by Artur Klinau) by philosopher Maksim Zhbankou can be found here (In Belarusian). Ihar Babkou’s text about Belarusian literature today in Hungarian Review (in English) is available here. Reflections upon his recent five books by Jan Maksymiuk (In Belarusian). Audio and video records of the author (Ihar Babkou reciting poetry). Ihar Babkou was born in 1964 and graduated in philosophy at Belarusian State University in Minsk in 1986. He underwent internship training in London, Warsaw, Paris and Berlin. The winner of literary prizes: Hliniany Vielies (1992) and Zalataya Litara (2005). Author of poetry books Solus Rex (1991), A Hero of the War for Transparency(1998)andTofallasleep, to awake, to listen to the voices of fish (2009),the novel Adam Klakocki and his Shadows (2001), and books of essays The Kingdom of Belarus: Interpretation of Ru[i]ns (2005), The Philosophy of Jan Sniadecki (2002). Translated J. Joyce, J. D. Salinger, W. B. Yeats, P. Celan. In the 1980s, he participated in the first self-published publications, as well as in the first independent meetings in Minsk. He took part in relaunching the weekly Nasha Niva, creating a new non-soviet Belarusian culture. In 1995, he founded the publishing house “Euroforum”. He is the author and signer of Belarusian Declaration of Freedom. His works have been translated into Polish, Ukrainian, German, Czech and Hungarian. 6 authors were nominated for Jerzy Giedroyc Prize. The book “Minute: Three stories” written by Ihar Babkou was awarded as the best book in Belarusia in 2012. First of all I would like to provide some details about the award. Jerzy Giedroyc Prize was established at the end of a 2011. Actually it's a price for the best prose book published in Belorusia in two genres: essay and poetical fiction. Vladimir Njakľaev won the price in 2011. During the ceremony which took a place in congress hall of thr Minsk hotel Victoria, writer and philosopher Ihar Babkou has received a cheque for 10 thausands € from Idea Bank. He said, he will spend money for good things but he also pointed out, that good things should be done quietly, not in front of the media. At the very end I would like to mention two other writes who were awarded as well. Artur Klinau was awarded as the second best writer in Belarusia while Vintses Mudrou was awarded as the third one. “Moment” is an existential story about self-reflection and search of self. The narrator guides the reader to a mysterious café where visitors don’t rush, but reflect on their lives and listen to their feelings. But something is going to happen. Bieloruská stránka upozornila verejnosť na fakt, že Ihar Babkou získal literárne ocenenie Visegrad Eastern Partnership Literary Awards. Tiež dáva do pozornosti, že cena sa bude odovzdávať 3. decembra na Univerzite Komenského v Bratislave. It´s really successful year for Ihar! His book, "Khvilinka" (Minute: Three stories") was awarded as the best book of prose, which was published (in paper or electronic format) in the previous year in the Belarusian language. Ihar Babkou: For most countries of Western Europe Byelorussia does not exist. It may exist as a political fact but not as a cultural space. In the beginning, when we gained independence in 1991, a desire appeared to disseminate the idea of Byelorussia in Europe, introduce it into Europe. In like manner a part of the issue of the Europeization of Byelorussia was conceived. After some concrete attempts to enter into dialogue, it appeared that this idea is too abstract and as such cannot be realized as we would dream it to be realized. Essentially, there is the myth of Europe that it does not correspond with any uniform space. There are different European cultures, different preferences, and the need to conduct dialogue with historical stereotypes looks differently here. For instance, it is very difficult for us to conduct such a dialogue with French culture, since the latter's traditional sympathy for Russia and Poland does not permit to notice anything between Russia and Poland. The dialogue with the Anglosaxon world is also very complex, for the very idea of culture is considerably different from the idea that is generally accepted in Byelorussia and Central Europe. Igor Bobkov, seems to be the first writer to say about multiculturalism in Belarus. This interview is about his feelings for Belarusian language, culture and history. He believes that "all will be good at the end". Some of his own words - "There is no Belarusian-language minorities, and no Russian-speaking majority, there is extremely stable majority of bilinguals. Which differ only by the fact that someone is a part of the Belarusians expresses themselves publicly, and others - quiet and intimate. Ihar Babkou says that he will spend 10 thousand euro for “good things”: “Good things shouldn’t be made public. They should be made quietly; in this way good deeds come to karma”, the author said. Ihar Babkou graduated in philosophy at Belarusian State University in Minsk in 1986 and underwent internship in London (1992), Warsaw (1995), Paris (1999) and Berlin (2008). Furthermore he is the winner of literary prizes: Hliniany Vielies (1992) and Zalataya Litara (2005). http://litradio.by/fanateka/994-gar-babko.html Audio records of Ihar Babkou. Babkov demonstrates not only exellent storyteller skills but also large intelectual and philosophical shot.The text is full of references on the chinese or anthic philosophy also on analytical philosophy of Whittgensteina existencionalism Sarta.It seems that the auther puts huge reqirements on the reader. It seems that the novel is easy read philosophical thinking reverses it in to the medicational level. In the 1995 he establish editorship Euroforum when he started publish magazine Fragmenty ( philosophia,studies of culture and lietrature), where founded the literature council "Byblyiateka Frahmenty"
From the end of 1990 with the lieteraure activities he started his academical career he working in the institut in Minsk, lecture on universities in Vilnius, Minsk. In 2003 he vindicate his dissertation. On June 2 the winner of Jerzy Giedroyc prize was announced in Minsk. Ihar Babkou the philosopher and writer was awarded the first prize. The book “Minute: Three stories” was recognized as the best book in Belarusian in the genres (poetical fiction” and “essay”. The book of the winner is about the places in which we come and where we come to stay. On September 9 at the start of an academic year in the Flying University called “University and the present” in area CECH in Minsk Babkou was asked about what has changed in his life after he received Jerzy Giedroyc Prize. “ For now nothing has changed, except I was fired from two universities – BSU (Belarusian State University) and EHU (European Humanitarian University), where I used to be a lecturer for the last 15 years and was closely tied with these universities. I was told they no longer needed my services. He was asked if can Belarusan intelligence pick up a wave of Ukrainian national rise.” You know, national rise in Ukraine has resulted from not a good occasion. And war is not something you should be envious about, even if it inspires a nation to reach its height. In the 1980s, he participated in the first samvydat (self-published) publications, as well as in the first independent meetings in Minsk. He took part in relaunching the weekly Nasha Niva, creating a new non-soviet Belarusian culture. In 1995, he founded the publishing house “Euroforum”. He is the author and signer of Belarusian Declaration of Freedom.His works have been translated into Polish, Ukrainian, German, Czech and Hungarian. I would like to share with you THIS VIDEO. Ihar Babkou is talking about himself and reading his own poets. Really interesting and inspiring to see. I. Babkou: First, the identity of Byelorussians has undergone some essential changes after 1991. Byelorussianness is going or has gone from ethnic identity to civic awareness, i.e. Byelorussians would be made aware as a further part of ethnic tradition, peasant's, rural nation, which creates its own space and is slowly transforming into civic identity.